Former FastCompany and current Maxim editor Jason Feifer hit a home run submitting an opinion piece for The New York Times on selfies. He was inspired by the misuse of the word “selfie” by the press. As Jason runs through what is and what is not a selfie, he will have you laughing out loud. 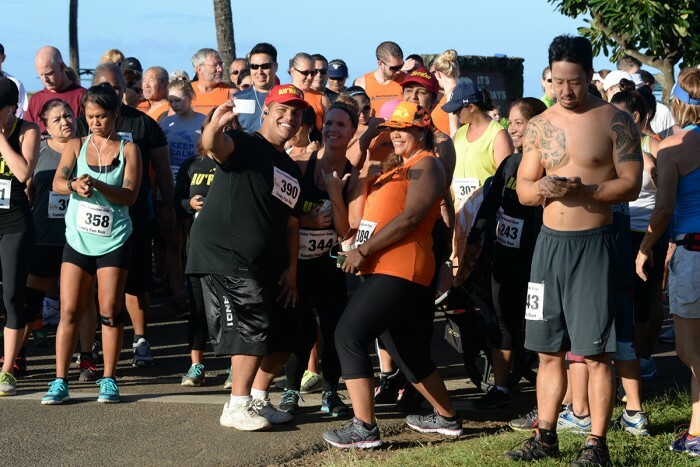 Selfie being taken at the starting line of Koloa Plantation Days charity Family Fun Run 5K. Snapshot by Ray Gordon. I know the feeling. I was once inspired to write an article on “How to Pronounce Karaoke” after watching news reporters one after another pronounce it incorrectly during the holiday season. My 2008 article still ranks on the first page of Google. “ALL selfies are photos. Not all photos are selfies. This distinction is lost on many — including brands on Twitter, television news anchors, your parents, and let’s be real, newspapers — which have used the word “selfie” to describe group photos, buildings, scenery and more. It’s time to clear up what exactly a selfie is. I held a camera and took a photo of myself. I took a photo of myself and two friends. That is a selfie. Also called a groupie. I set the self-timer on a camera, stepped back five feet, and it took my photo. That’s in the selfie family, but isn’t a pure selfie. Consider it a self-portrait. Are you in the photo with the pizza? No, it is just of the pizza. I took a photo of a photo of myself. That is a photo of a photo of yourself. I used a selfie stick to take a photograph of myself. I used a 300-foot selfie stick to take a photograph of myself, but because of the distance, I am barely visible in the photo. That is still a selfie. I used a 300-foot selfie stick to take a photograph of myself, but before the camera went off, a migrating trumpeter swan grabbed the camera, somehow aimed it at me, and tapped the shutter. The bird took a photo of you. Not a selfie. The bird also took a photo of itself. Then the bird also took a selfie. I swallowed a camera that is programmed to take a photograph every time I breathe. Is that safe? Please check with a doctor. But it is taking my selfies. No, it is not. Remember when your grandma took a photo of you with your iPhone, and half her finger covered the lens? Your grandma did not take a selfie, even though part of her body was visible in the photo. Oh, but there was that time my grandma turned the camera on herself, and the photo was 75 percent her finger and 25 percent her face. The photo is of the photographer, who is holding the camera. That is a selfie, though not a very good one. I took a photo of myself inside the Large Hadron Collider. Now that is a great selfie. I took a photo of the Hadron Collider without me in it, and called it a “matter selfie” because I am matter, and the camera is matter, and the Hadron Collider is matter. But the selfie is matter, too. If all photos of matter were selfies, then all photos would be selfies. But they are different words because they are distinct things. What is the self, anyway? It is the identifiable subject of a selfie. I took a photo of my soul mate as she gazed into my eyes. We feel we are one. We are the same person, the same self. I took a photo of myself during an existential crisis. My life has no value; my self is vacant. I took a photo of a millennial. Have you been looking for that boost to your Personal Brand by guest posting for a big media outlet? Maybe try an opinion piece. This worked for Jason. But they only use his name with no description. He is fortunate to have a unique, easy to “google” name. “What I do: print magazine editing, video hosting, web writing, etc. What TV Newscaster error has inspired you to write a blog post?